A walk round Reffley Wood on the afternoon of August 8th primarily to look for butterflies and dragonflies netted two surprises – a butterfly fresh to the area and my first sighting of a buzzard flying over the Wood. 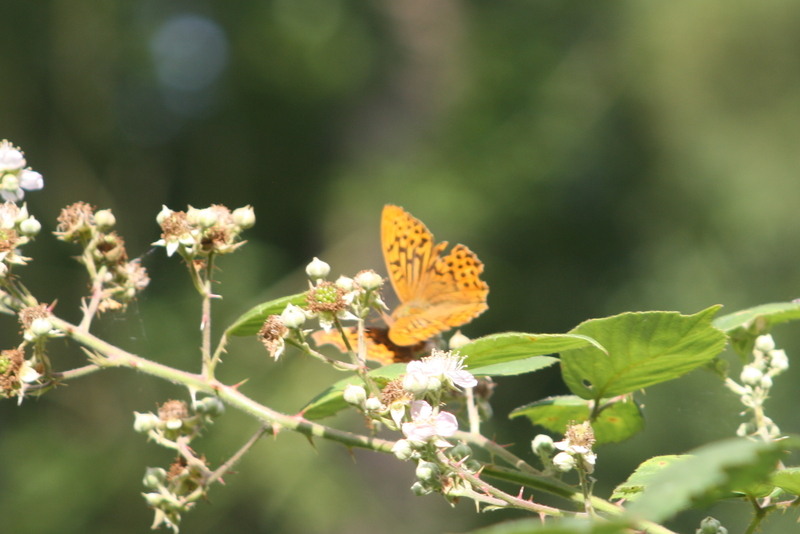 The “newcomer” turned out to be a silver- washed fritillary with orange wings marked with black. I didn’t see the underside, with the silver wash. I had actually taken it be a comma, although when I had looked at it through the camera lens before pressing the shutter, I did have a faint thought it may be something different. When I looked at the photo later, I was sure it was something different – and it looked very much like the silver-washed fritillary shown in my field guide! A quick glimpse could easily leave you thinking you’d seen a comma, since both butterflies are mainly orange with black markings, but the fritillary has rounded wings whereas the comma has very ragged edges to its wings. Norfolk’s Butterfly Recorder, Mr Andy Brazil, confirmed the find as a male silver-washed fritillary. He had mentioned to us a few weeks earlier that he thought silver-washed fritillaries might be heading our way! If Reffley Wood has violets fairly close to oak trees or other trees with rough bark and crevices, it is possible the fritillaries may eventually be tempted to breed here. The female butterfly lays her eggs in the crevices of the tree trunk, where they overwinter. In spring, the eggs hatch and the tiny caterpillars start making their way towards the nearest suitable patch of violets to continue their lifecycle. As Mr Brazil commented, let’s hope our male silver- washed fritillary finds a girlfriend before his time at Reffley Wood runs out! The male Silver-washed Fritillary has a Comma as its reflection. When we had first seen the newcomer on Saturday afternoon, it had been interactaing with a comma on a sunny bramble patch in the ancient wood. I’m glad I didn’t take it to be another comma and not bother with a photo! I must admit commas are one of my favourite butterflies – colourful, with personality and a big plus, I find it much easier to get a pleasing image of a comma than of most other butterflies. A Comma, showing its underwing and the mark which gives it its name. Another big bonus of Saturday’s outing was the buzzard sighting. I heard a sort of “peeoor” or “keeoor” type call while I was standing in the main clearing watching out for butterflies and dragonflies and it seemed to be heading in that direction. When I looked up, there was a large bird gliding way up above me across the sky. It swept back and forth a few times. sometimes climbing even higher, right up against the occasional clouds. Through binoculars, I could see lighter patches on the underside of the wings, reminding me of the birds I’d seen flying over a recreation area a few miles away about a week earlier. At that time, someone had said they were buzzards. I was really pleased! I had often heard that call while in the wood recently and wondered if it might come from a buzzard and now I knew. It gave me a great feeling, because I’d been right on this occasion and my patience had been rewarded. My husband and I had gone to Reffley Wood to do a final Big Butterfly Count before it ended the following day. During the 15 minutes, we had spotted one each of the large and small whites, two commas, one meadow brown and one gatekeeper. I did manage to net a better picture of a white butterfly, which so often don’t slow down, at the end. Generally speaking, there wasn’t as much butterfly life as we’d expected. There was also a beetle with long antennae, wandering along a log. Several common darter dragonflies were sharing the brambles in the sunny clearing, using them as perches to await passing prey. We saw one or two bigger dragonflies, but not closely enough to attempt an identification, I’m sorry to say, apart from saying they were probably the speedy hawkers. 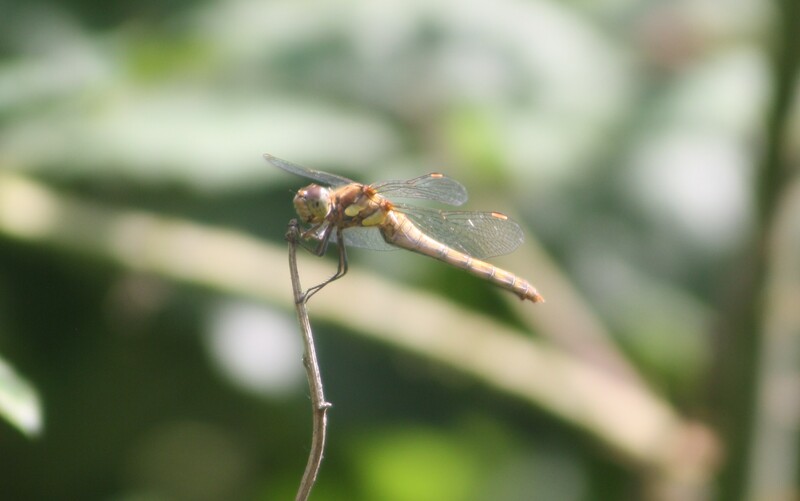 A female Common Darter dragonfly. Anyway, I think it nevertheless qualifies as a very rewarding afternoon out!